You may be aware of the AQL which stands for Acceptable Quality Level. Some sources abbreviate AQL as Acceptable Quality Limit. If you have researched about the AQL chart, you might have seen a different form of AQL charts in the various sources. That is because, shipment inspection in done at various level - like level-I, level-II and level-III. Also, the sampling of the shipment lot is done as - single sampling and double sampling. 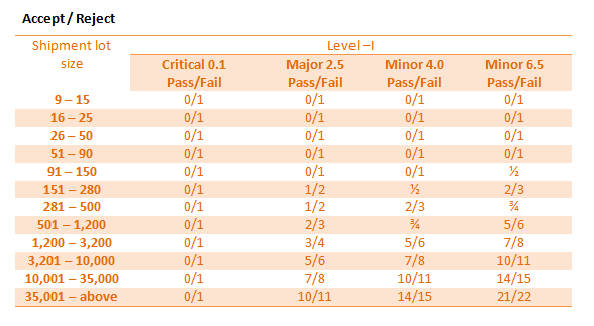 Further AQL level is categorized as AQL 0.1, AQL 2.5, AQL 4, AQL 6.5 etc. When you prepare AQL chart with all these combinations, you will get various AQL charts. Here we will be talking about AQL chart used for shipment inspection in the apparel industry. In the apparel industry normally single sampling is followed. In this chart shows single sampling. Number of pieces to be selected as sample for the specific lot size of the shipment are shown. Like, if your shipment lot size is 550 pieces (between 501-1200), you have to pick 32 pieces as sample for level -I sampling. 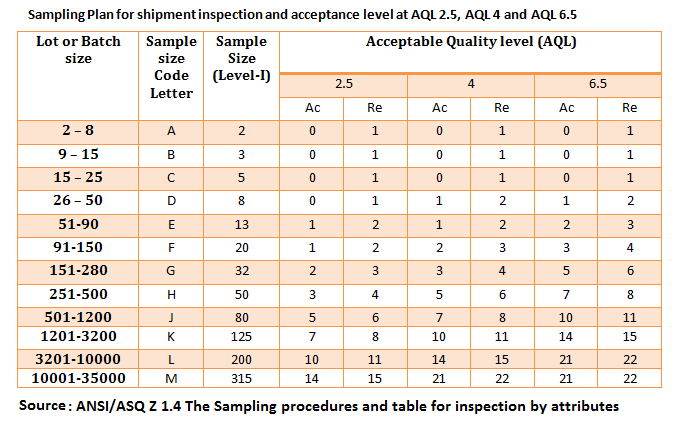 In this chart, shipment acceptance and rejection criteria are shown for level-I sampling and different AQL level for the specific lot sizes. Note: The AQL level and associating AQL level with the severity of defects like Critical, Major and Minor defect depend on the customer's requirement and product type. Follow your buyers quality manual for the AQL levels for different kind of defects. For example, let's say you shipment lot size is 550 pieces garments and you are following AQL 2.5 for shipment inspection. 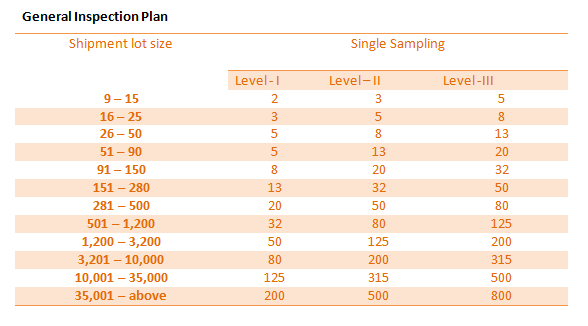 As per the sampling plan, you need to pick 32 pieces of garments. In the inspection, if you get 2 or less than 2 defective pieces in 32 garments, then shipment will be accepted (passed). If you get 3 or more defective garments shipment will be rejected (failed).